Real quick update on LOST, as I think I'm starting to figure out how things are going to shake out. At the end of last week's show, "Everybody Loves Hugo," the remaining original castaways showed up at Locke's camp to have a sit down with whoever/whatever is occupying Locke's body. Hurley, Jack, Sun, and Lapidus have now been reunited with Kate, Sawyer, Claire, etc. We also saw that Locke threw Desmond down into a well, when he realized that Desmond was not afraid of him. When Episode 13, "The Last Recruit," begins, it looks like everybody will be working together - with Locke - to secure the plane on the other island and fly home. However, this was not to be. When Widmore's people show they have the ability to strike the camp with missiles, Locke decides to push his plan into action ahead of schedule. He sends Sayid to kill Desmond, and sends Sawyer to retrieve a sail boat so they can all sail to the other island. It is unclear whether or not Sayid actually killed Desmond. I think he didn't, even though he told Locke he did. This is probably a sign that Sayid is not fully under Locke's control. 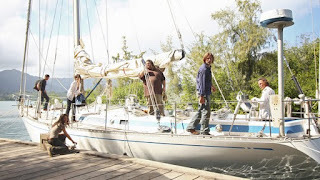 Sawyer and Kate go to retrieve the boat, but before they do, he tells Jack of his alternate plan of ditching Locke, meeting up with Widmore, and leaving the island in the submarine. Claire and Sayid are not invited. Jack et al are able to escape and they meet up with Sawyer. Unfortunately, Claire sees this and feels abandoned once again. After Kate insists that if Claire can't come, then she won't go either, Claire hops aboard the boat. I'm still not sure Claire is not under Locke's spell, though she does appear to have moments of lucid, normal behavior. Her threat/promise to kill Kate is still out there, however. The big moment in the episode comes when Sawyer and Jack have yet another fight. Jack explains that he feels wrong about leaving the island, and thinks the plan is a bad one. Sawyer tells him either he's with him or he's off the boat. Jack jumps into the water and swims away. Strangely, in that conversation, Jack called Sawyer by his real name, James. Not sure he'd ever done that before or what it means. Earlier in the show, Jack and Locke had a private one-on-one. Locke revealed that he had been the one masquerading as his father when they all first arrived on the island. Later, in a conversation with Claire, she tells Jack that by allowing him to speak to him, Jack has already fallen under Locke's spell. It would appear, based on Jack's exodus from the boat, that she may be right. But, I see it differently. A few episodes back, when Jack saw Jacob's lighthouse, Jacob told Hugo that Jack would need to find his purpose on his own. I have long suspected that of all the "candidates" to replace Jacob, that Jack would be the one. He had the most problems of anyone dealing with life off of the island. I think Jack's desire to stay on the island has nothing to do with falling under the control of Locke. I think he plans to kill him. By being the only one to remain behind, he should get Locke's trust. Locke is aware of Jack's candidate status, but must believe that he has turned him to the "dark side" or whatever. If Desmond is still alive, he will be involved in this attempt to kill Locke as well. I imagine it will have something to do with unleashing the electro-magnetic energy that Desmond already proved he is immune to. It's either that, or the real Locke somehow emerges and re-takes control of his own body. In the alternate-reality created with the flash sideways, the castaways are slowly finding themselves remembering things from the island or remembering people they met there, despite not realizing they were there. Kate and Sawyer, Hurley and Libby, Charlie and Desmond, and others are finding strong connections to people they thought they did not know. When Jack was going to hear his father's will read, he meets Claire for the "first time" and learns she is his sister. At that very moment, Jack is called away for an emergency operation. His patient is Locke. Desmond is the catalyst for all of these meetings, and his intentional attack on Locke (hitting him with his car in the school parking lot) was probably his way to connect Locke and Jack - and not to kill Locke as I had previously thought. Either way, I don't see Jack going over to the dark side, but I'm not sure he ends up killing Locke either. The real wild card is Charles Widmore. What, exactly, is his agenda? He just broke off his deal with Sawyer and took his crew into custody (right after the reunion of Sun and Jin, awww). What the hell is he really up to?